Kawawa naman sila. Pati pana ninakaw ng mga Chinese. Gov natin walang silbi. No comment ang mga dutertards dyan. Who do we call for help pagdating sa Chinese abuse? Kay Lord na lang siguro. Malacanang to the rescue. napanood ninyo yun press breifing ni Chinese Spokeman Harrot Roque? Malacanang came to the rescue of the Chinese Coast Guard. meron daw barter trade. 10 malalaking isdang Mameng para sa Chinese noodles. may nakita ba kayong dalang noodle yun mga PIRATANG Chinese Coast Guards sa video?? kawawang mangingisda. itsura pa lang takot na takot. parang pinadampot ng Malacanang sa Zambales para lang sa Moro Moro ..... este Press Briefing. baka kaya may nag-landing na Chinese military plane sa Davao ay dahil dito? MANILA - China still has a strong grip on Scarborough Shoal (Panatag Shoal), Filipino fishermen said Monday, even as Malacañang insists that the situation in the rich fishing ground has improved since President Duterte came to power. Concerns over a renewed tension between China and the Philippines in the rich fishing ground grew last week after a television report showed Chinese coast guard personnel getting the catch of fishermen who pass by the shoal, located only 124 nautical miles off Zambales. Roque said no formal protest is needed against China since Manila and Beijing enjoy friendly ties under Duterte. He noted that since the President assumed power in 2016, Filipino fishermen were again allowed to fish in shoal following years of Chinese blockade under the administration of former president Benigno Aquino III, who hailed China to a United Nations-backed arbitral tribunal. The tribunal invalidated China’s claim to almost the entire South China Sea and declared that both the Philippines and China have “traditional fishing rights” to the shoal. But Filipino fishermen from Masinloc town in Zambales said China remains to have control over the shoal, dictating the movement of vessels with its fleet of coast guard ships in the area. Romel Cejuela said Chinese coast guard personnel continue to block access of bigger Filipino fishing vessels to the shoal’s lagoon, where most of the best marine resources in the area can be caught. He said Filipinos are still allowed by the Chinese to enter the lagoon, but only using smaller fishing boats. He said this was not the case when he started fishing in Scarborough in early 2000s. The Philippine coast guard, in contrast, has no ships in the area, Cejuela said during a press briefing with Roque. Cejuela, however, said the absence of Filipino authorities in the shoal may be better after all, as he said another standoff between the two countries might trigger China to bar Filipino fishermen from the area once again. “Mabigat sa kalooban kaya pilit mong tanggapin kasi sila ang may power ngayon d'yan,” Cejuela said. Cejuela also sought government help in stopping Chinese coast guard personnel from getting their catch. He said some Chinese coast guard personnel would sometimes give water, cigarettes and food in exchange for their catch, but he said these were not enough to offset their loss. “Sometimes I would sit over the cooler where my best catch is stored. The Chinese coast guard personnel would ask me to move,” Cejuela said. 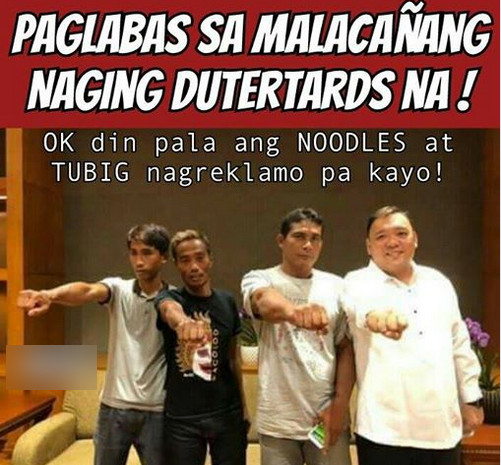 Added Roque: "Kada kinukuhanan sila ng isda, bibigyan sila ng noodles, sigarilyo at pinakaimportante, tubig, dahil parati silang nagkukulang sa tubig. 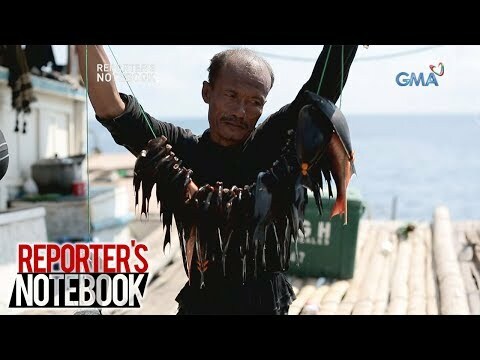 There had been reports last year of an emerging “barter” system between Filipino fishermen and Chinese coast guardsmen, but it was only this year that the Filipinos lamented that they were on the losing end of this system. Roque said the situation where the Chinese controls access to the lagoon is still better compared to what it was under the previous administration, where Filipino fishermen were totally barred from entering the shoal and sometimes chased away by Chinese coast guard water canons. He added this practice would also help prevent “overfishing” in the area. He also described the actions of the “rotten” Chinese coast guard personnel as a “small incident” that should not affect the overall ties of the Philippines and China. “China should discipline its rotten coast guard personnel. This is not acceptable, [but] I would not say it was harassment. You know what harassment is? During the time of President Aquino,” Roque said. He added the Chinese coast guard’s actions do not represent Beijing’s official policy, citing the promise of Chinese President Xi Jinping to Duterte to finally allow Filipino fishermen to harvest from the shoal. Scarborough was the site of a 2012 standoff between the Philippines and China, when Manila sent its biggest warship to chase off Chinese poachers. China then gained effective control of the shoal after Manila withdrew its vessel. It then started blocking Filipino fishermen from the shoal. The Chinese blockade was one of the reasons the Philippines went to the arbitral tribunal. Roque, then an activist lawyer, also helped fishermen like Cejuela file a complaint against China before the United Nations. The shoal is a potential flashpoint in the disputed sea, as maritime experts say Beijing is eyeing to build another artificial island there to fully cement its control of the vital waterway. watching the press briefing and knowing what the fishermen experienced, we can say it was passive harrassment by the chinese coastguard. the chinese knew they are in control. 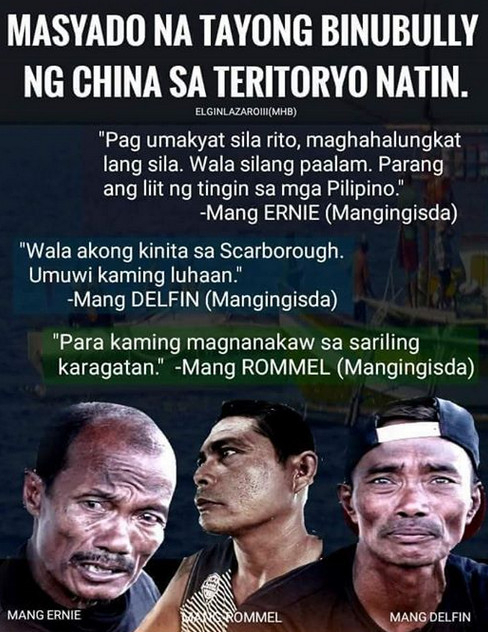 the chinese bulldozered the pinoy fishermen knowing they will not do anything as the chinese are strong (with ships and all) while the fishermen think of themselves lowly, like squatters in their own backyard ika nga nung isa. taktika ng gobyernong duterte ngayon ang diplomasya. kahit paano may narating na naman ito dahil nakakapangisda na ulit ang ating mga kababayang mangingisda kahit na hindi ganoong kalaya. ang dapat lang talagang gawin ng mga mangingisda ngayon ay patuloy na pakikipag-ugnayan sa gobyerno at media na rin upang maiparating ang mga pangyayaring kinakaharap nila mula sa mga instik. ang gobyerno naman ay ang patuloy na pakikipag-ugnayan gamit ang diplomasya sa tsina upang matugunan naman sa hanay ng mga instik ang ating mga obserbasyon. umaayon ba sa kasunduan ang ginagawa ng kanilang coastguard? tingnan natin kung ano ang gagawing aksyon ng tsina. mahirap baguhin ang loser mentality ng pinoy pero dapat simulan nating baguhin ito. alam nating dehado tayo laban sa tsina pero meron pa rin tayong magagawa at ito ay hindi sa pamamaraang biglaan. sa ngayon pabor ako sa diplomasya. unti-untiin natin ang pagbawi dahil hindi talaga kaya ng biglaan. mas kawawa sila nung panahon ni AQUINO! "The handling is, tingnan niyo ha, anong nadatanan ni Presidente namin, nung pumasok kami ni Presidente? Ha? Kasi nga medyo mainit 'yung kwan noon eh, nong nadatnan natin. Wala tayong trade with China. 'Yung ating mga product natin hindi nila binibili. Walang tourist na pumupunta rito. Hindi tayo nakakapangisda doon sa Scarborough Shoal. 'Yung ating mga tropa hina-harass nila. Ngayon we sell our bananas there; they buy all our bananas. Tourist nila dito nag-doble," Lorenzana said. "We can fish there and 'yung ating mga tropa hindi na hina-harass, except 'yung very isolated incident 'yung sa Ayungin. So is that mismanagement? We have managed it very well through the President's leadership. Hindi mismanaged 'yon. Ang nag-mismanage 'yung previous administration dahil nagkagulo-gulo rito," he added. 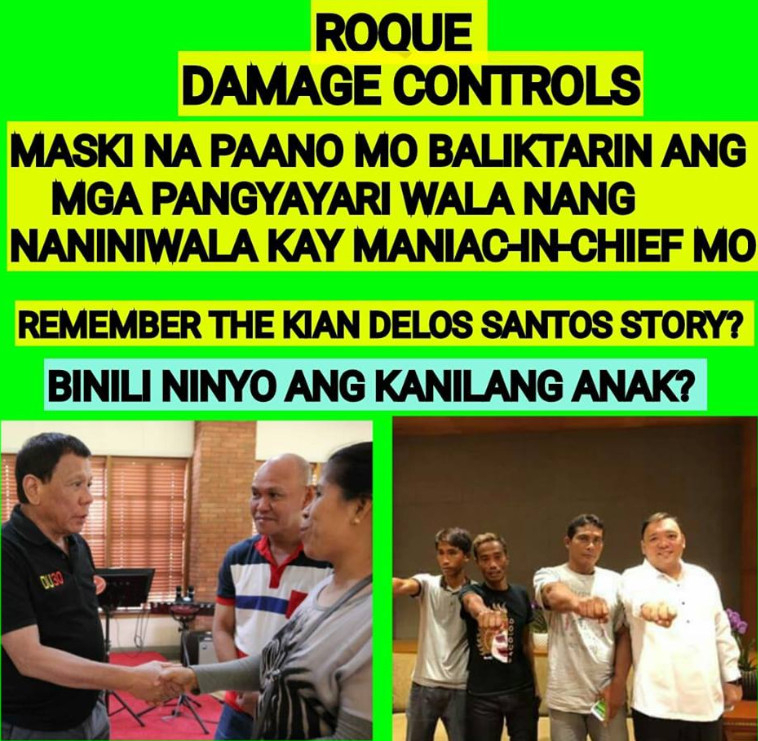 sino dumampot sa mga kawawang mangingisda papunta sa Malacanang? PSG?? Davao Death Squad??? o si Harry Roque at ang Commission on Human Rights???? i find this insensitivity and politicizing the plight of our poor fishermen disturbing. nakupo ang dilawan talaga mahina utak. Syempre proceso lung yan hindi madalian. Panahon ni Panotski di nakakapangisda. Ngayon nakakapangisda pero may aberya. Malaking bagay na yun no. 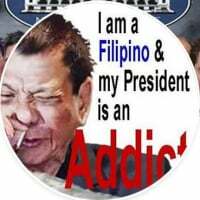 Pero syempre hindi hihinto si Tatay digong sa pakikipagusap para tuluyan na maging libre ang mga mangingisda dyan. Buong taon ni Panotski walang nagawa para mapayagan ang mga tao natin na mangisda dyan. Si tatay nagawan ng paraan na mapapasok dyan tayo nang walang gera na nangyare. Oo hindi perpekto pero darating din tayo dyan. Parang Kuwait lung yan. Puro batikos kayo pero sa dulo napirmahin din lung ang MOU sa kuwait. One suggested another round of Den Hague. The first did not convince China. Doing a second won't change a thing. You guys should read the ruling. Because it states there that China, Vietnam and Philippines have the right to fish there. And even if its within PH EEZ, it is still international water and thus any ships from any country are free to navigate. MANILA, Philippines (UPDATED) – China said on Tuesday, June 12, that it has allowed Filipino fishermen to fish in Panatag Shoal (Scarborough Shoal) in the West Philippine Sea (South China Sea) "out of goodwill." This negates the claim of Philippine Foreign Secretary Alan Peter Cayetano on Sunday, June 10, that the Philippines and China have forged a provisional fisheries agreement as equal parties in Panatag Shoal. "China has made appropriate arrangement for the Philippine fishermen to fish in relevant waters out of goodwill. This policy remains unchanged," the Chinese embassy in Manila said in a press release Tuesday morning. China issued this statement in reaction to a GMA News report showing the China Coast Guard taking the catch of Filipino fishermen in Panatag Shoal. The Chinese embassy continued: "At this point, the China-Philippines friendly relations have taken on a positive trend, and China has a clear and firm determination to commit itself to consolidating and strengthening China-Philippines relations." The embassy said Chinese coast guard personnel "have been safeguarding peace, order and tranquility in relevant waters and offered humanitarian aid to Philippine fishermen for many times." Referring to the China Coast Guard, the embassy said, "They have always acted in accordance with the law." "As to whether the situation mentioned by the media exists or not, the Chinese side is now conducting an investigation seriously. If what the Philippine side claimed is true, I believe relevant Chinese departments will handle that in a serious manner," the embassy added. In a Malacañang press conference on Monday, June 11, Panatag Shoal fisherman Rommel Sihuela confirmed that China has control over Panatag Shoal, as China "allows" them to fish there. Presidential Spokesperson Harry Roque presented Sihuela and two other fishermen on Monday to describe to reporters the real state of Panatag Shoal. When asked by a GMA-7 reporter about who has control over Panatag Shoal, Sihuela replied: "Sa tingin ko ngayon, parang Tsina pa rin. Pero dahil sa magandang ano ng Pilipinas at saka China ngayon parang iyon nga… kaya pinapayagan tayo ng ano – iyong patuloy na pagkakaibigan na ng China at saka Pilipinas, doon pinapayagan na ang Pilipino na mangisda diyan." The Chinese embassy issued its statement on Panatag Shoal as the Philippines marks its 120th Independence Day. Chinese Ambassador to the Philippines Zhao Jianhua attended the Independence Day rites with Philippine President Rodrigo Duterte in Kawit, Cavite. Zhao promised that Chinese coast guard personnel proven to have taken the catch of Filipino fishermen will be "disciplined. "Acting Chief Justice Antonio Carpio said the Philippines cannot invoke sovereign rights over the Panatag or Scarborough Shoal since the 2016 decision of the Permanent Court of Arbitration (PCA) did not settle the dispute with China for lack of jurisdiction. Thus, Carpio said, the government should push for protocols with China on the Filipinos’ fishing activities in the contested area in the West Philippine Sea (WPS). Carpio, a member of the Philippines’ arbitration team in the PCA, said the arbitral ruling clearly stated that Filipinos have the right to fish in the Panatag Shoal together with Chinese fishermen." If I remember right… About the Panatag being lost during the Aquino administration. Panatag was under the control of the Philippines. Phl Navy chased off Chinese boats considered as poaching in the area. The Chinese navy shielded the Chinese fishermen. There was a standoff. There was a negotiation (reportedly brokered by the US Navy). The Chinese and Phl military will both withdraw from the area. In a day or two, the Chinese returned in force, reneging from its obligation under the negotiated “arrangement”. It was not to be doubted that there could have been fireworks if the Phl navy returned: a Vietnam-like little battle, in the Paracels. Knowing what could be the result, the Phl ran to the UN Arbitration Court. Unclos. Should the previous admin instead have bowed to the Chinese then, after the confrontation, like the Phl is now doing? We would not have had the favorable decision via the UN process if we kept quiet, I think. 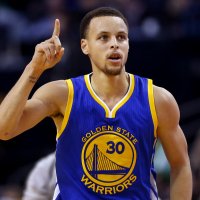 Now, we have the “W”. It is time to trade, and work to reclaim control. No war need. I believe. Barter is a trading where parties negotiate the terms. If only one party dictates the terms, that is not barter. Not even a "barter of sort". hindi naintindihan ni kanor yan brad tagalugoin mo.. sabaw utak nun eh.. kala nila yung pinagmamalaking nakuhang desisyon ni panot eh may karapatan na tayong paalisin ang mga tsekwa ..
mga bugok kasi puro sigaw ang alam.. kapag nag gyera san kayo pupulutin? mga tang.a kasi yang kampon ni buddy at kanor! The Philippines should not make a big deal out of China’s response to the reports of harassment by its coast guards to Filipino fishermen. “China has made appropriate arrangement for the Philippine fishermen to fish in relevant waters out of goodwill. This policy remains unchanged,” China’s Foreign Ministry spokesman Geng Shuang said following reports that members of its coast guards have been forcefully taking the catch of Filipino fishermen in the disputed area. Such response irked critics who found the statement insulting especially it was issued during the Philippines’ 120th Independence Day. “Out of whatever pa yun, pwedeng pride nalang yun, masabi lang. Kaya ‘wag na nating masyadong damdamin pa yung mga ganun pananalita at baka lumaki pa ‘yon (It may have been said out of whatever, maybe pride, just to respond to the issue. So we should not take offense from such remarks or it may worsen the issue),” Sotto said in an interview during the wake of former national security adviser Roilo Gomez in Taguig City. 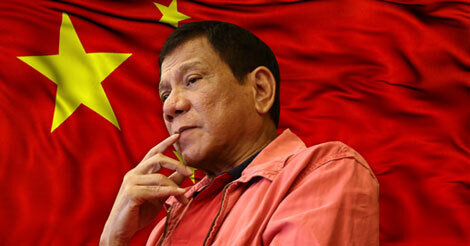 He also urged Filipinos to swallow their pride and accept China’s assurance. “Huwag na lang tayong masyadong mataas ang pride,” Sotto said. Sotto, like some of his colleagues in Senate, believes that the reported intimidation by Chinese coast guards to Filipino fishermen should not be blamed to their government. The fishermen interviewed in a documentary said patrollers board their boats to take their catch, and sometimes trade it with packs of noodles and cigarettes. “Inihahambing ko yan sa kabalbalan ng ilang mga sundalo sa Mindanao, palagay mo. Hindi natin pwedeng ibintang sa buong gobyerno ang kasalanan. Kung sa coast guard ng China ay merong dun maiinit sa mga mangingisda natin — na ang balita ko naman pinapalitan naman ng mga noodle at sigarilyo yung mga kinukuha nilang isda — palagay ko, hindi naman kasalanan ng China ‘yon (I compare that to the misconduct of some soldiers in Mindanao, I think. We cannot charge the incident to the whole Chinese government. If some Chinese coast guards are picking on our fishers — although I heard that they replace with noodles and cigarettes the fishes they take — I think it was not the fault of China as a country),” Sotto said. The Senate chief said he trusts the Chinese government will reprimand its coast guards. “We should observe what China would do about this incident. Maybe after that, we will see that our relation with them would improve,” he said. “We should be close friends with China because we have more in common than any other country in the world. So let’s observe their actions,” Sotto said. These critics want no less than putting the country in war footing with China over something that does not merit such response, Lacson, a former Philippine National Police (PNP) chief, said. Lacson said it might be prudent to await the feedback of the Chinese government on the outcome of their investigation and the corresponding disciplinary action they would take against the concerned Coast Guard personnel. ‘’From the perspective of the (United Nations) arbitral ruling two years ago, where Scarborough shoal has been declared as a rock that generates no EEZ (Exclusive Economic Zone) and therefore officially a free fishing area among the claimant countries, the acts perpetrated by the Chinese Coastguard crew are nothing but crimes of robbery or piracy,’’ he pointed out.